SAN DIEGO, CA (US), April 2019 — For some cancers, initial treatment with chemotherapy brings positive but only temporary results: Tumors shrink, but then rebound as the cancer becomes drug-resistant. This pattern of remission-resistance relapse is particularly true for pancreatic cancer, an aggressive disease in which early success is often countered by eventual disease progression. The reason is that current multidrug chemotherapy regimens targeting pancreatic cancer typically do not fully eradicate all cancer cells, leaving behind drug-resistant cells that harbor aberrant stem cell properties and can drive tumor regrowth and metastasis. In a new paper published in the April 4 online issue of Cell, an international team of scientists led by researchers at University of California San Diego School of Medicine employed an array of next-generation sequencing and gene-editing tools, such as CRISPR, to map the molecular dependencies —and thus vulnerabilities — of pancreatic cancer stem cells. Most notably, they found that a key hormone receptor called retinoic acid receptor-related orphan receptor gamma or RORγ, previously studied in inflammation and T-cell differentiation, was especially active during pancreatic cancer progression, and that blocking it markedly slowed patient-derived tumor growth and improved survival in animal models. “These studies revealed an unexpected role for immunoregulatory genes in the maintenance of the most aggressive, drug-resistant cells in pancreatic cancer,” said senior study author Tannishtha Reya, Ph.D., UC San Diego professor in the departments of pharmacology and medicine. In particular, RORγ emerged as a key regulator. RORγ rose with cancer progression and its inhibition through genetic and pharmacological approaches resulted in a striking defect in pancreatic cancer growth. “Our work shows that immune system signals are hijacked by pancreatic cancer, and suggests that therapies currently being tested for autoimmune indications should be considered for testing in pancreatic cancer,” said Dr. Reya. 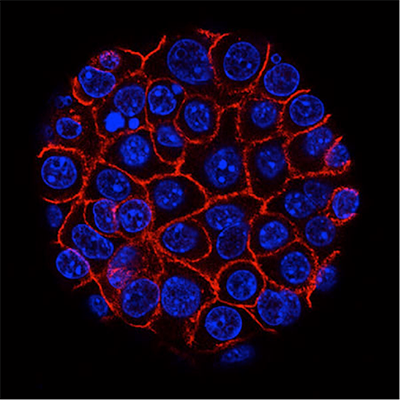 Pancreatic cancer cells (blue) growing as a sphere encased in membranes (red). Photo courtesy of National Cancer Institute.